Fairfax Avenue is a street in the north central area of the city of Los Angeles, California. 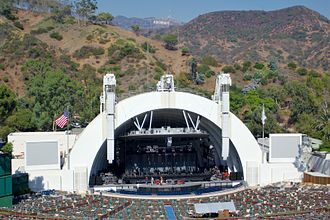 It runs from La Cienega Boulevard with Culver City at its southern end to Hollywood Boulevard in Hollywood on its northern end. 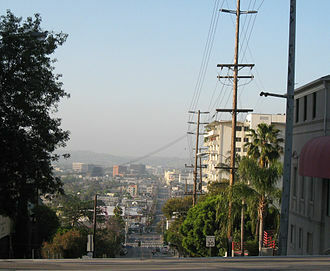 From La Cienega Boulevard (between Culver City and Mid-City) to Sunset Boulevard (between West Hollywood and Hollywood), it separates the Westside from the central part of the city along with Venice Boulevard, La Cienega Boulevard, Hauser Boulevard, San Vicente Boulevard, South Cochran Avenue, Wilshire Boulevard, 6th Street, Cochran Avenue, 4th Street, La Brea Avenue, Fountain Avenue and Sunset Boulevard. Fairfax Avenue forms the western boundary of Hancock Park as well as Park La Brea, a 160-acre (0.6-km²), 4,222-unit apartment complex with over 10,000 residents. Since World War II, the Fairfax District has been a heavily Jewish neighborhood in Mid-City West. Fairfax High School, on the corner of Fairfax and Melrose Avenue, was known as the alma mater of many entertainment industry personalities. Canter's Deli has been a late night hangout in Los Angeles since the 1940s. CBS's Television City is located on the corner of Fairfax and Beverly Boulevard,where thousands camp out to wait for a chance to watch The Price is Right. 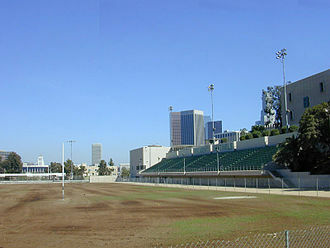 The former site of Gilmore Stadium, where the minor league baseball team, the Hollywood Stars, used to play prior to the Dodgers moving from Brooklyn. World-famous recording studio, Cherokee Studios, home to over 250 gold and platinum recorders, is just above Melrose Avenue. The Grove is off 3rd Street and Fairfax. Due to the volume of high density attractions, Fairfax is one of the most congested streets in Los Angeles. Little Ethiopia is further south by Olympic Blvd and north by Pico Boulevard in the Pico-Robertson neighborhood in West Los Angeles. South of Olympic, Fairfax narrows to two lanes, Pico Boulevard between the Crestview and Pico-Robertson neighborhoods in West Los Angeles and Venice Boulevard between the Crestview and Pico-Robertson neighborhoods in West Los Angeles and Lafayette Square in Mid-City. At the northeast corner of Wilshire Boulevard and Fairfax is the former May Company department store building, which was converted to the Los Angeles County Museum of Art and will be the future home of the Academy Museum of Motion Pictures. The Petersen Automotive Museum is located on the south corner. Metro Local line 217 and Metro Rapid line 780 serve Fairfax Avenue. An underground station for the Metro Purple Line at Wilshire Boulevard is currently under construction and is due to open in 2023. ^ Maggie Barnett (May 23, 2004). "Freshly hip, Park La Brea is an urban oasis". Los Angeles Times. Retrieved August 9, 2012. Metro Local is a bus system in Los Angeles County operated by the Los Angeles County Metropolitan Transportation Authority. This retronym designation was placed to differentiate it from the Metro Rapid service, Metro Local buses cover both local, limited-stop, and shuttle bus services. Metro Local buses are distinguished by their prominent orange color, based on availability of equipment, units in non-Metro Local livery may be placed into service on lines that normally use Metro Local buses. There are bus lines that are operated under contract with MV Transportation, Southland Transit, Metro Local buses can be found on 400-series and 500-series routes, which are Metro Express routes with different fare structures and routing. Metro buses are given numbers that indicate the type of service offered. This method was devised originally by the SCRTD, Metros predecessor, all service operated by Metro as of June 26,2016. Local bus service to/from Downtown Los Angeles and other areas, the line numbering begins at line 2 and proceeds counterclockwise around Downtown Los Angeles, ending at line 96 East/west service, not necessarily serving Downtown Los Angeles. 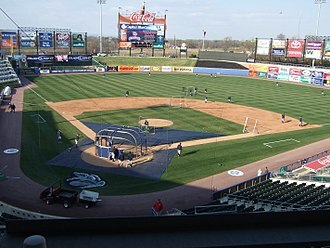 All of the minor leagues are operated as independent businesses. Most are members of the organization known as Minor League Baseball. 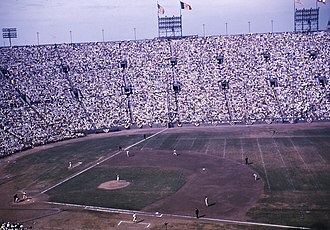 Several leagues, known as independent baseball leagues, do not have any links to Major League Baseball. Major League Baseball and Minor League Baseball teams may enter into a PDC for a two- or four-year term. At the expiration of a PDC term, teams may renew their affiliation, or sign new PDCs with different clubs, though many relationships are renewed and endure for extended time periods. Minor League teams that are owned directly by the major league club do not have PDCs with each other and are not part of the reaffiliation shuffles that occur every other year, several more independent leagues operate in the United States and Canada. 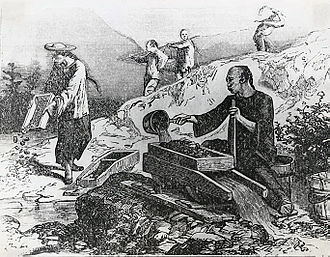 The earliest professional baseball association, the National Association of 1871 to 1875 and this system proved unworkable, however, as there was no way to ensure competitive balance, and financially unsound clubs often failed in midseason. This problem was solved in 1876 with the formation of the National League, with a membership which excluded less competitive. Professional clubs outside the National League responded by forming regional associations of their own, there was a series of ad hoc groupings, such as the New England Association of 1877 and the Eastern Championship Association of 1881. These were loose groups of independent clubs which agreed to play a series of games for a championship pennant, the first minor league is traditionally considered to be the Northwestern League of 1883 to 1884. 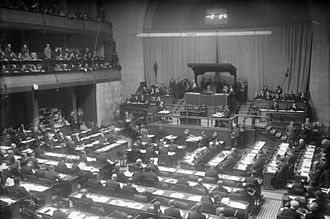 Unlike the earlier minor associations, it was conceived as a permanent organization and it also, along with the National League and the American Association, was a party to the National Agreement of 1883. 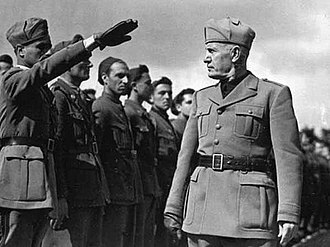 Included in this was the agreement to respect the reserve lists of clubs in each league, teams in the National League and the American Association could only reserve players who had been paid at least $1000. Northwest League teams could reserve players paid merely $750, implicitly establishing the division into major and minor leagues, over the next two decades, more minor leagues signed various versions of the National Agreement. 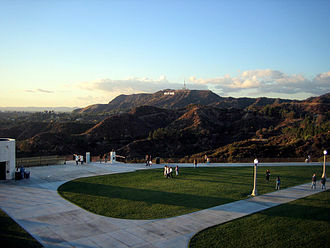 West Hollywood, occasionally referred to locally as WeHo, is a city in Los Angeles County, United States. 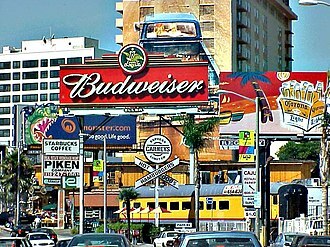 Incorporated in 1984, it is home to the Sunset Strip, as of the 2010 census, its population was 34,399. 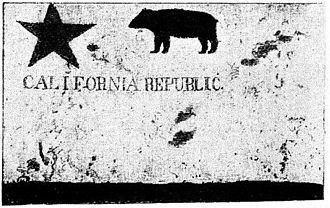 It is considered one of the most prominent gay villages in the United States, the citys irregular boundary is featured in its logo, it was largely formed from the unincorporated Los Angeles County area that had not become part of the surrounding cities. West Hollywood benefits from a dense, compact urban form with small lots, mixed land use. According to Walkscore, a website that ranks cities based on walkability, commercial corridors include the nightlife and dining focused on the Sunset Strip, along Santa Monica Boulevard, and the Avenues of Art & Design along Robertson and Beverly Boulevard. Major intersecting streets typically provide amenities within walking distance of adjacent neighborhoods, West Hollywood has a Subtropical-semi-arid climate with year-round warm weather. The record high temperature of 111 °F was recorded September 26,1963, snow is rare in West Hollywood, with the last accumulation occurring in 1949. Rainfall is sparse, and falls mainly during winter months, around 5,000 of the indigenous inhabitants from the Tongva Indian tribe canoed out to greet Juan Cabrillo. The Tongva tribe was a nation of hunter-gatherers known for their reverence of dance, by 1771, these native people had been severely ravaged by diseases brought in by the Europeans from across wide oceans. 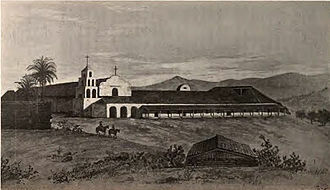 The Spanish mission system changed the name to Gabrielinos, in reference to the Mission de San Gabriel. 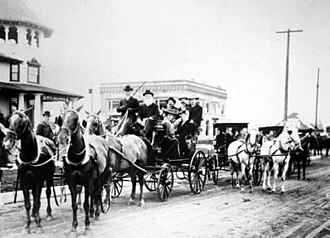 The Gabrielinos are believed to have burned the pitch for fuel, by 1780, what became the Sunset Strip was the major connecting road for El Pueblo de Los Angeles, and all ranches westward to the Pacific Ocean. This land passed through the hands of owners during the next one hundred years. Most of this area was part of the Rancho La Brea, Sherman became the location of the railroads main shops, railroad yards, and car barns. 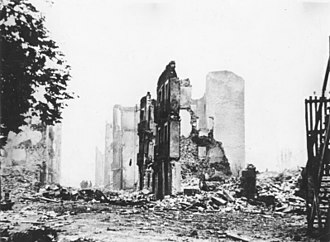 Many working-class employees of the railroad settled in this town and it was during this time that the city began to earn its reputation as a loosely regulated, liquor-friendly place for eccentric people wary of government interference. West of Laurel Canyon, it continues as a residential street and ending at Sunset Plaza Drive. 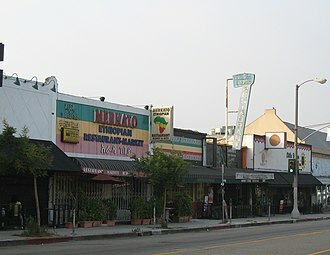 The eastern end of Hollywood Boulevard passes through Little Armenia and Thai Town, parts of the boulevard are popular tourist destinations. 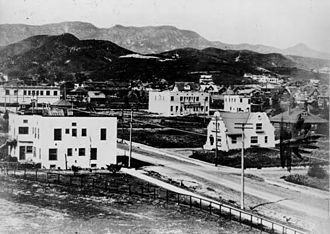 Prior to Hollywood Boulevard, the street was named Prospect Avenue until 1910, after annexation, the street numbers changed from 100 Prospect Avenue, at Vermont Avenue, to 6400 Hollywood Boulevard. 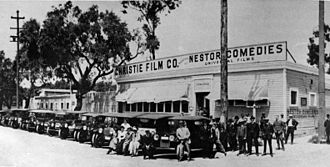 In the early 1920s, real estate developer Charles E. Toberman envisioned a thriving Hollywood theatre district, Toberman was involved in 36 projects while building the Max Factor Building, Hollywood Roosevelt Hotel and the Hollywood Masonic Temple. With Sid Grauman, he opened the three themed theatres, Egyptian, El Capitan, and Chinese, and was inspired to write Here Comes Santa Claus with Oakley Haldeman. In 1958, the Hollywood Walk of Fame, which runs from Gower Street to La Brea Avenue, was created as a tribute to artists working in the entertainment industry, the El Capitan Theatre was refurbished in 1991 damaged in the 1994 Northridge earthquake. The full El Capitan building was restored and upgraded in December 1997. 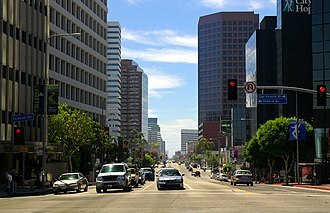 The Hollywood Entertainment District, a business improvement district, was formed for the properties from La Brea to McCadden on the boulevard. The Hollywood extension of the Metro Red Line subway was opened in June 1999, stops on Hollywood Boulevard are located at Western Avenue, Vine Street, and Highland Avenue. Metro Local lines 180,181, and 217, and Metro Rapid line 780 serve Hollywood Boulevard, an anti-cruising ordinance prohibits driving on parts of the boulevard more than twice in four hours. 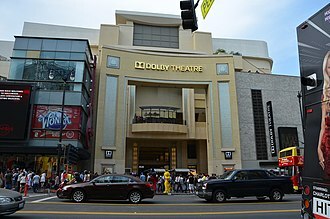 Beginning in 1995, Los Angeles City Council member Jackie Goldberg initiated efforts to clean up Hollywood Boulevard, central to these efforts was the construction of the Hollywood and Highland Center and adjacent Dolby Theatre in 2001. 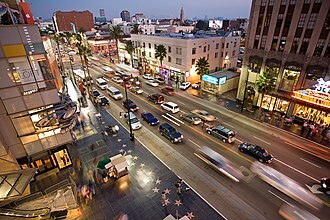 In early 2006, the city made revamping plans on Hollywood Boulevard for future tourists, the three-part plan was to exchange the original streetlights with red stars into two-headed old-fashioned streetlights, put in new palm trees, and put in new stoplights. The Los Angeles Westside is an urban region in western Los Angeles County, California. In 2000, non-Hispanic whites made up 63% of the population, the areas within the city of Los Angeles that Los Angeles Almanac recognized as part of the Westside had a population of 413,351. Fifty-three percent of West Los Angeles residents aged 25 and older had earned a degree by 2000. They included 89,620 people with degrees or higher and 117,695 with bachelors degrees. In addition,95,187 people in age range had some college experience. There were 46,823 with high school diplomas but 40,451 who had dropped out before graduating, the Westside is home to the University of California, Los Angeles, a public research university in the Westwood neighborhood. It is the second-oldest of the ten campuses of the University of California system, UCLA is considered a flagship campus of the University of California system, along with UC Berkeley. It offers undergraduate and graduate programs in a wide range of disciplines. 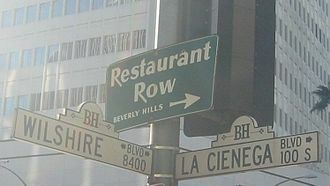 Beverly Boulevard is one of the main east-west thoroughfares in Los Angeles, in the U. S. state of California. It begins off Santa Monica Boulevard in Beverly Hills and ends on the Lucas Avenue overpass near downtown Los Angeles to become 1st Street, work on paving Beverly Boulevard through Northwest Los Angeles began in the 1910s, making it one of Los Angeless first boulevards. The Boulevards most famous stretch is in West Hollywood, where it passes Cedars-Sinai Medical Center, in addition, much of the Fairfax District is centered on Beverly Boulevard. The Grove is southeast of Beverly and Fairfax, the intersection of Beverly and La Cienega is the center of the studio zone, the area that Los Angeles-based entertainment industry unions consider as local for purposes of work rules. 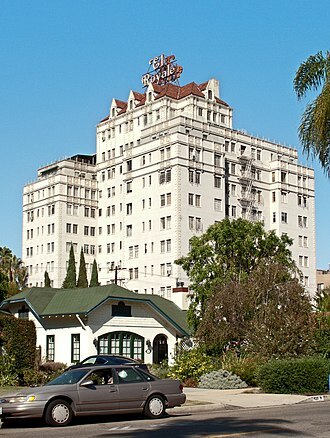 Beverly Boulevard runs parallel to Melrose Avenue to the north and 3rd Street to the south and it passes directly through the Wilshire Country Club. 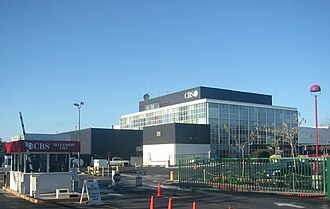 The famous CBS Television City is located on the corner of Beverly and Fairfax, original Tommys, a famous Southern California burger chain, is located at the corner of Rampart and Beverly Boulevards. Hancock Park is a historic and affluent residential neighborhood in the central region of the City of Los Angeles, California. It is built around the grounds of a golf club. Developed in the 1920s, the neighborhood features architecturally distinctive residences, the neighborhood is low density, with a 70. 7% white, highly educated, older-aged population of 10, 600+ people. Most of the residents are home owners, there are four private and two public schools in the area. Hancock Park was developed in the 1920s by the Hancock family with profits earned from oil drilling in the former Rancho La Brea, the area owes its name to developer-philanthropist George Allan Hancock, who subdivided the property in the 1920s. Hancock Park activists were instrumental in the passage of a 1986 Congressional ban on tunneling through the neighborhood. The ban, sponsored by Congressman Henry Waxman, prevented the Red Line Subway from being routed along Wilshire Boulevard through the neighborhood, street boundaries are Melrose Avenue on the north, Arden Boulevard on the east, Wilshire Boulevard on the south and La Brea Avenue on the west. 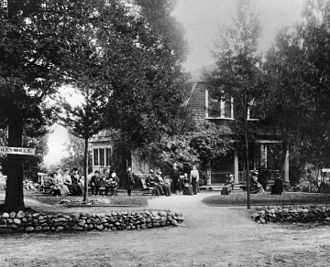 The neighborhood surrounds the grounds of the Wilshire Country Club, the Hancock Park Homeowners Assn. counts about 1,200 homes within the boundaries of Melrose Avenue, Wilshire Boulevard and both sides of Highland and Rossmore avenues. The Hancock Park Homeowners Association defines Melrose Avenue and Wilshire Boulevard as two of the streets of Hancock Park. The houses on both sides of Highland Avenue and Rossmore Avenue, the boundary streets, are defined as a part of Hancock Park. The homeowners association counted 1,200 houses within Hancock Park, the 2000 U. S. census counted 9,804 residents in the 1. 59-square-mile neighborhood—an average of 6,459 people per square mile, including the expanse of the Wilshire Country Club. That figure gave Hancock Park one of the lowest densities in Los Angeles, in 2008, the city estimated that the population had increased to 10,671. The median age for residents was 37, considered old when compared with the city as a whole, Hancock Park was moderately diverse ethnically. West Los Angeles is a term for two residential and commercial areas in the city of Los Angeles, mapped differently by different sources and on opposite sides of the Interstate 405 Freeway. Each of them lies within the larger Westside region of Los Angeles County, the borders of the official West Los Angeles Neighborhood Council correspond closely to this second definition. Specifically, its district stretches from the 405 freeway in the east to Centinela Avenue in the west and Wilshire Boulevard in the north, in 2003, a Los Angeles Times correspondent noted that, The meaning of the term West Los Angeles varies widely. Some use it to describe the entire Westside including Santa Monica, sections of West L. A. run the gamut from stylish Cheviot Hills to a cluster of generic homes east of Bundy Drive. Her report on the meaning of West Los Angeles included Rancho Park and its density of 13,319 people per square mile, about was average for the city of Los Angeles but among the highest densities for the county. The percentage of Asian people is high for the county and the area is highly compared to both City of Los Angeles and County of Los Angeles averages. Mexico and Iran are the most common places of birth. Notably,49. 8% of residents 25 and older have a four-year degree, the percentages of never married males and never married females are among the countys highest. Its density of 12,061 people was average for the city of Los Angeles. It had a high percentage of white people compared with the county at large,76. 7%. Others ethnicities were Asian,11. 4%, Latino,5. 3%, black,2. 3%, and other,4. 1%. The median household income in east Mapping L. A. area was $86,403 in 2008 dollars, the percentage of households earning $125,000 and up was high for the county. Median age of residents was 38, old compared with other locality in the city, the average household size was 1.9, low for both the city and the county. 51% of residents rented their living quarters, and 49% owned them, the percentage of widowed men and women was among the countys highest. The Holmes-Shannon House in Victoria Park was built in 1911. Oki's Dog on Pico Blvd. 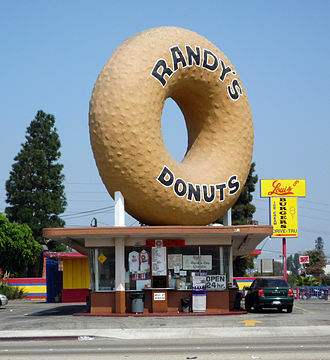 Original Tommy's at the corner of Rampart and Beverly Blvd.